Matthew 17:20,“And Jesus said unto them, Because of your unbelief: for verily I say unto you, If ye have faith as a grain of mustard seed, ye shall say unto this mountain, Remove hence to yonder place; and it shall remove; and nothing shall be impossible unto you”. 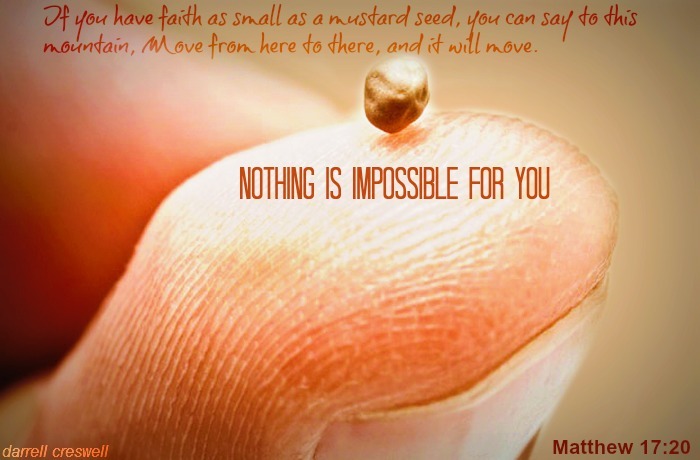 Have you ever wondered if there is a difference between “Little Faith” and “Mustard Seed Faith?” I have, it seems to me that a mustard seed would qualify as being “little” right? So what is little faith? the word “little” means “incredulous (unwilling to believe) or lacking confidence”, it’s a faith that is stagnant, weak, not trusting or believing in someone or something. It’s a do nothing faith as spoken by James in chapter 2 verse 17, “Even so faith, if it hath not works, is dead, being alone”. This is the opposite of mustard seed faith, Mark 4:30-32, “And he said, Whereunto shall we liken the kingdom of God? or with what comparison shall we compare it? It is like a grain of mustard seed, which, when it is sown in the earth, is less than all the seeds that be in the earth:But when it is sown, it groweth up, and becometh greater than all herbs, and shooteth out great branches; so that the fowls of the air may lodge under the shadow of it.” The mustard seed though having a very small beginning, it measures about 1/64th of an inch, when it is planted into the soil grows to a rather large tree, about 20 feet high and 20 feet wide. It can grow in the worst of soils and all different climates, just as we as Christians must do. It’s a faith that will take chances, maybe because of its smallness it must rely on its creator much more than the larger seeds in this world, the largest seed is the “Coco der mer” measuring up to 12 inches and weighing 40 pounds. Little faith puts limits on God, mustard seed faith says all things are possible, little faith does not allow for healings, mustard seed faith expects it, little faith does not believe in miracles, mustard seed faith cries out for it. Little faith cannot stand up to the pressures of this word, mustard seed faith pushes back, little faith affects no one for the kingdom, mustard seed faith turns the world upside down for Jesus Christ. So if you would describe your faith, would it be “little faith” or “mustard seed faith”?